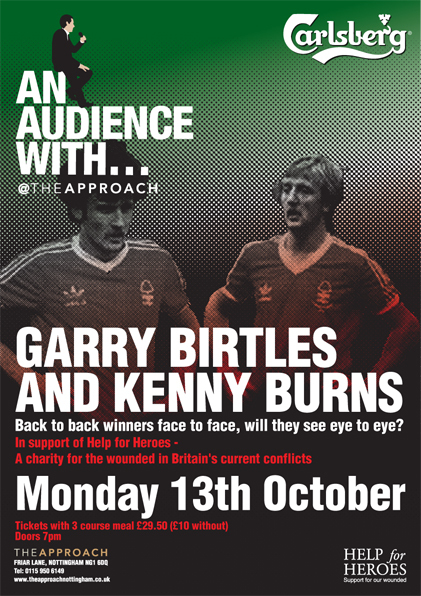 An audience with Garry Birtles and Kenny Burns.. | Through the seasons before us..
An audience with Garry Birtles and Kenny Burns..
How about an opportunity to forget all our present day worries on the pitch and revel in a spot of reminiscing about when times couldn’t get any better? Well you can do just that on 13th October by popping down to The Approach on Friar Lane in Nottingham, and basking in the reflected glory of European Cup winners Garry Birtles and Kenny Burns. Both former players provide fairly regular comment upon the fortunes of the Reds in the local paper, however I’m assured by the organisers of the event that there will be even fewer punches pulled than in their respective columns for this evening of questions hosted by Darren Fletcher. It certainly promises to be an interesting evening given the typical outspokenness of the two people in question. You can click on the flyer to get all the details – but in a nutshell it’s Monday 13th October, the doors open at 7:00pm, tickets are mere £10 (or for £29.50 you can opt for a three course meal); and best of all the night is supporting the Help for Heroes charity, who do amazing work in supporting wounded members of the armed forces. So you can not only have a great night for a decent fee, but you can feel good about supporting a great charity as well. I’ve had the pleasure of a few nights like this down at the Approach now, and they never fail to deliver – so I would recommend highly popping down and checking it out. Ps Would love to be there but am stuck out here working in the middle east so a report back on this blog on what is bound to be a quality night will have to do. I believe Century lost the rights to broadcast after altercations with the club around the time of David Platt; I’m not 100% sure of the ins and outs, but I was generally (unfortunately – at the time of Platt!) at the games, so rarely entered into the fairly prevalent choosing of the radio stations. Some people get quite worked up about it! I find Radio Nottingham is okay these days when I don’t make it to a match. Omani Red – no need to worry about blowing smoke up Fletcher’s arse. The bloke’s so far up his own he could comfortably manage it for himself. That may well be, I don’t know him personally – he is a very good commentator though. Seems a shame to have lost out on someone like that. I guess our loss is 5 Lives gain. I really don’t understand why you would be critical of BBC Radio Nottingham. Fletcher is a muppet and an amateur. What you get from Colin Fray is professional commentating at its best, that’s all I want when I tune in to know what is happening to my team. I am sure Fletcher does the evenings very well as it massages he ego nicely……..